This contest is now closed. Thank you all for your interest in my giveaways! 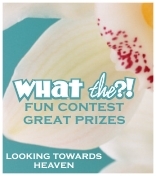 The winners of all four of my giveaways and this weeks What The? will be announced later today (Feb. 2) in a separate post. I love to design. It is one of my favorite things. My other two giveaways are items I have given away before, in prior giveaways (not these exact items… you know what I mean…) But this one is new. Recently, I’ve been creating blog banners for others. This is after having created my own for the past 2 years of my blog. This giveaway if for a custom blog banner/header and matching button to put in your sidebar for others to spread the word about your blog. To see samples of what I have done in the past, visit this page for a partial portfolio. For your chance to win, just leave a comment on this post. I’ll leave the comments open until this Saturday, February 2nd. Then I’ll use my trusty hat to pull the name of the winner. This contest is open to anyone – worldwide. If you don’t win this giveaway, be sure to visit my blog each Tuesday for a chance to win a blog banner/header (and other great prizes). Read here for more information. *Updated to add that I posted the original photo from last week and this weeks image here. That purse is great. Please pick me. I would just love that. Ah! Another Tennessee Blogger! LOVE IT!! I couldn’t figure out your picture, but I do have a Puzzler contest similar to yours (monthly or so…;) ). I’d love to win your giveaway; hope you have time to visit mine. pick me pick me, I need a new blog header desperatly!!! Your work is fantastic!! I’ve been having trouble coming up with a banner for one of my blogs, and I would love to win this prize! Great giveaway! My blog could use a makeover! You have beautiful work! I especially love the snowflakes. Please enter me in your drawing. Thank you. A very creative give away. My blog could use your touch. and, I’m glad that your “what the” is only for a week and not for the whole month. I’m seriously dying over here. What a great giveaway! I need a facelift for my blog!! I so need this for my blog. I’m starting another blog soon and would *love* some help! I’d love to win for my book blog, Karla. please enter me. You do such beautiful work! Put my name in the hat, please! my blog needs help! I would LOVE THIS!!! Thanks for the giveaway! Awesome prize. Please enter me. I definitely need this. I’m new to blogging and have the same old plain, boring blog design as a lot of other new bloggers. Count me in! Thanks! I could use a new look. Count me in! I love your header! I would love a blog makeover!!!! Please include me. Your work is very nice, and I would love a professional look to my blog. Thank you for giving this away! I need to get blogging. This would help. Great prize! I could use a blog update. I sure could use a facelift- thank you! Hope I win. I’ve got my fingers crossed. This is my first visit to your blog. Looks like fun!!! Thank you for the compliment although I’m quite sure I am not so lovely looking today. I look like rudolph sitting in his recliner with a box of kleenex next to him and sound like a toad. And my blog looks even worse! We sure could use your help around here! Thanks for the chance to win! Great giveaway:) Count me in! Stop by my place to win a bath set & candles or one of two copies of a book I’m giving away. I sure would like to win this. I have only just started blogging and haven’t the foggiest as to what I’m doing. Thanks for the great giveaway! Would LOVE this! PLease count me in! Thanks for the contest! We could use this! Your portfolio is just beautiful! I would be honored to have one of your designs on my blog. Awesome prize! Could really use this one! You do beautiful work….I love your header! great contest – count me in!! My blog is hoping to be a winner here! Please enter me! Love it!!! I would love to win! I would love a bloglift! please enter us for your great giveaway!! thanks so much!! Count me in! I would LOVE that!!! Perfect, just what I need right now! Great prize. Count me in too please. I didn’t know you designed blogs! I just left a comment on your other giveaway (one of them!) about how you should do this. This is such a cute blog. Pick me! I love it!! Great one. Count me in! Thanks! I’d love to start me own blog — so this would be great! mlciavola(at)yahoo(dot)com. enter me please! t hanks! Great give-away…please sign me up. Your designs are so pretty! Please count me in! I am in need of a new design, need to get away from the template, so please include me in your drawing. I just started my blog and want it to match up with “me” better. I have finally decided to jump on the blog wagon but need a lot of help with the graphics. I’d love to win this. great blog love the name of yours! please enter me into this lovely giveaway! Come by and visit me soemtime there is always something being made on my blog! Awesome! Count me in please! Ooh, ooh! Pick me, pick me! Your work looks good. I hope I win, thanks! My husband and I would love to partake of your creativity for our new blog. You do good work. I’d love to win a button/banner for my blog. Thanks for the opportunity. Thank you so much for saying I look lovely! :) You do too! Seriously, I enjoy your blog. Thanks for the giveaway! I need a new look, please sign me up. I think this is one of my favorite giveaways! What a unique giveaway! My blah blog could use some spicing up…hope I win!! How do I need a banner??? Let me count the ways!! Actually all you need to do is click on my name and you will see my poor pathetic blog and I have absolutely no idea how to make a banner. Please enter me into your drawing! My blog design is boring and generic – I’d love to make it unique! I love “winning” creativity! Thanks! I am actually getting ready to start a new blog for my business. I’d love to win this! Thanks for the chance–I’d love to start a blog. I love your designs!!! They are so nice! would love to win this!!! I would love to have a button/banner for my site. Great Giveaway! Sign me up! That’d be great to win! It would be nice to have a new blog look. Lovely blog and great prize. Enter me to win. Very cool prize! thanks and please visit mine, too! Great give away!! Count me in I would love it! What a fun giveaway! I’d love to win this as a gift for my best friend. Thanks! I’d love a facelift – pick me! I would LOVE this so much! Imagine my very own button! What fun! oh how i’d love to win this! i know nothing about template design but would love to spruce up my blog! Oh, we’ve been waiting since the fall to make it to the top of someone’s list for design. No luck. This would be great! What a fantastic, creative prize! Thanks for offering it up for a giveaway! Love it! Your designs are great. Please enter me to win! This is so nice, thank you! Please enter me! Thanks and check out my give a way! I love your current Header! Count me in! me too, me too! thanks! I so need the blog header! OOOO- I could really use this!! Please enter me. Thank you very much. I’m just getting started in this blog world – this would be great! Please count me in. Thanks for hosting! Thanks, you too (look lovely.) Count me in! I would love to have a nice banner for my blog. Lovely work! I could use a bloggy facelift. Thanks for hosting this, and blessings to you. Wonderful! Please include me and THANK-YOU! Your designs *are* very nice. Thanks for hosting this giveaway. My blog could use a new look. Ooh, I thought I’d already left a comment, but I don’t see it, so here I am. I’d LOVE your prize! My poor boring blog could use some sprucing up. Please enter me! This would be so awesome! Please sign me up. Thanks for all this fun!